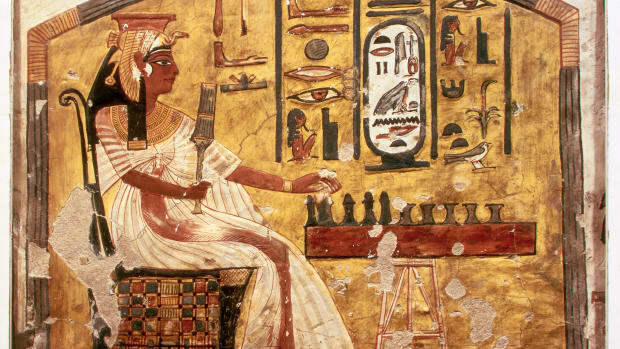 Since no contemporary accounts exist of Cleopatra’s life, it is difficult to piece together her biography with much certainty. Much of what is known about her life comes from the work of Greco-Roman scholars, particularly Plutarch. Born in 70 or 69 B.C., Cleopatra was a daughter of Ptolemy XII (Auletes). Her mother was believed to be Cleopatra V Tryphaena, the king’s wife (and possibly his half-sister). In 51 B.C., upon the apparently natural death of Auletes, the Egyptian throne passed to 18-year-old Cleopatra and her 10-year-old brother, Ptolemy XIII. Did you know? In the days between Cleopatra&apos;s death and Octavian&apos;s formal annexation of Egypt, her 16-year-old son Caesarion was officially sole ruler. He had no way of taking power, however, and was captured and executed shortly after his mother&apos;s suicide. Soon after the siblings’ ascension to the throne, Ptolemy’s advisers acted against Cleopatra, who was forced to flee Egypt for Syria in 49 B.C. 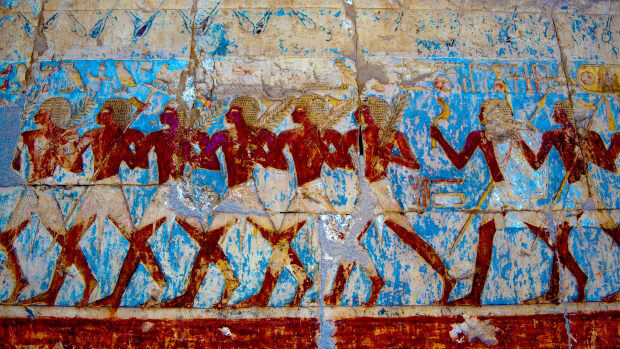 She raised an army of mercenaries and returned the following year to face her brother’s forces at Pelusium, on Egypt’s eastern border. 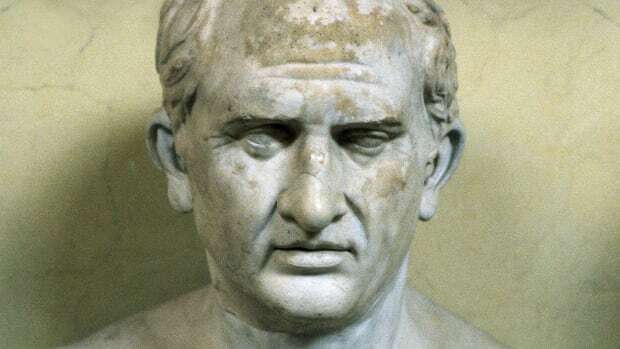 Meanwhile, after allowing the Roman general Pompey to be murdered, Ptolemy XIII welcomed the arrival of Pompey’s rival, Julius Caesar, to Alexandria. In order to help her cause, Cleopatra sought Caesar’s support, reportedly smuggling herself into the royal palace to plead her case with him. For his part, Caesar needed to fund his own return to power in Rome, and needed Egypt to repay the debts incurred by Auletes. 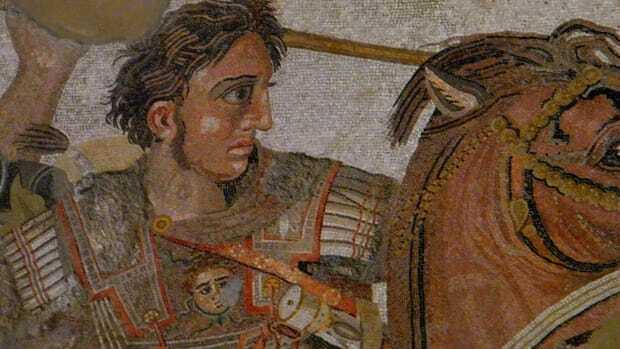 After four months of war between Caesar’s outnumbered forces and those of Ptolemy XIII, Roman reinforcements arrived; Ptolemy was forced to flee Alexandria, and was believed to have drowned in the Nile River. Entering Alexandria as an unpopular conqueror, Caesar restored the throne to the equally unpopular Cleopatra and her younger brother Ptolemy XIV (then 13 years old). Caesar remained in Egypt with Cleopatra for a time, and around 47 B.C. 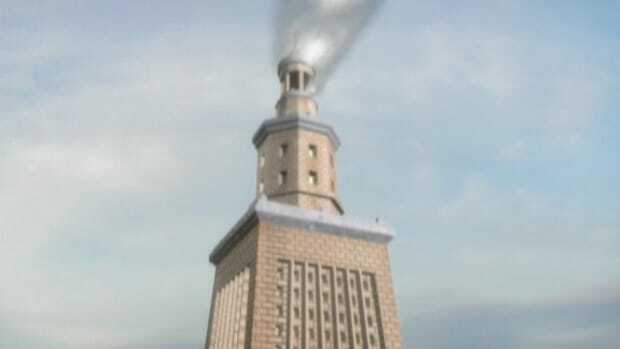 she gave birth to a son, Ptolemy Caesar. He was believed to be Caesar’s child, and was known by the Egyptian people as Caesarion, or Little Caesar. 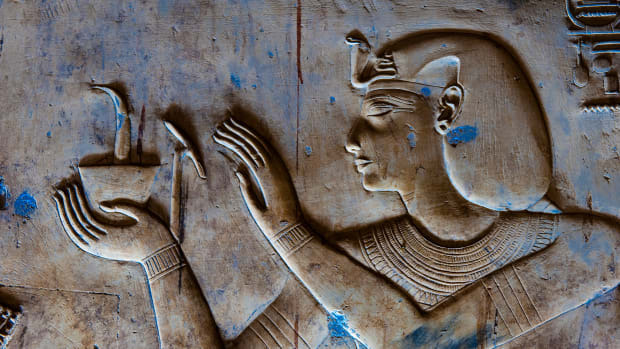 With her infant son as co-regent, Cleopatra’s hold on power in Egypt was more secure than it had ever been. 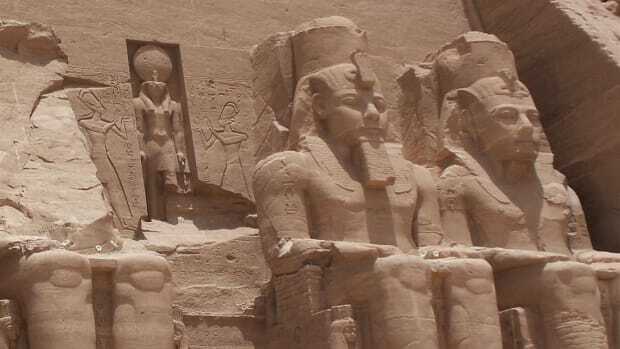 Still, unreliable flooding of the Nile resulted in failing crops, leading to inflation and hunger. 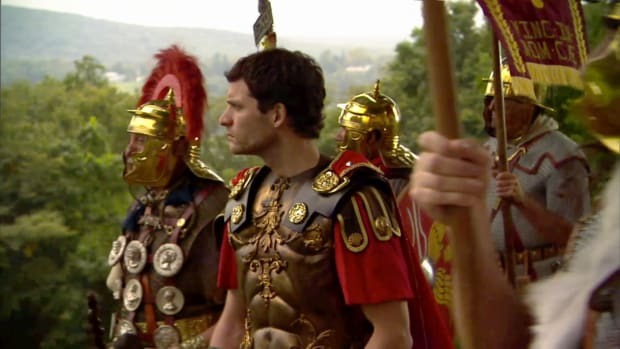 Meanwhile, a conflict was raging in Rome between a second triumvirate of Caesar’s allies (Mark Antony, Octavian and Lepidus) and his assassins, Brutus and Cassius. Both sides asked for Egyptian support, and after some stalling Cleopatra sent four Roman legions stationed in Egypt by Caesar to support the triumvirate. In 42 B.C., after defeating the forces of Brutus and Cassius in the battles of Philippi, Mark Antony and Octavian divided power in Rome. Mark Antony soon summoned Cleopatra to the Cicilian city of Tarsus (south of modern Turkey) to explain the role she had played in the complicated aftermath of Caesar’s assassination. According to the story recorded by Plutarch (and later dramatized famously by William Shakespeare), Cleopatra sailed to Tarsus in an elaborate ship, dressed in the robes of Isis. Antony, who associated himself with the Greek deity Dionysus, was seduced by her charms. He agreed to protect Egypt and Cleopatra’s crown, pledging support for the removal of her younger sister and rival Arsinoe, then in exile. Cleopatra returned to Egypt, followed shortly thereafter by Antony, who left behind his third wife, Fulvia, and their children in Rome. He spent the winter of 41-40 B.C. in Alexandria, during which he and Cleopatra famously formed a drinking society called “The Inimitable Livers.” In 40 B.C., after Antony’s return to Rome, Cleopatra gave birth to twins, Alexander Helios (sun) and Cleopatra Selene (moon). After Fulvia took ill and died, Antony was forced to prove his loyalty to Octavian by making a diplomatic marriage with Octavian’s half-sister Octavia. 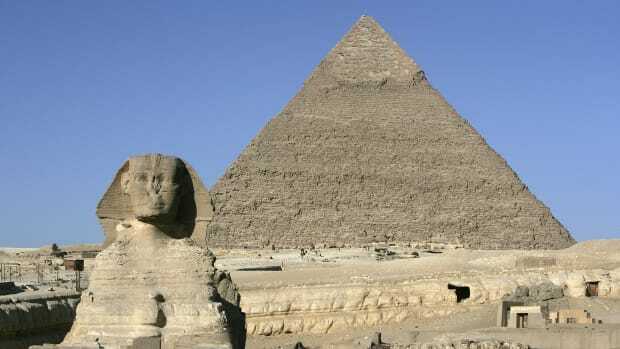 Egypt grew more prosperous under Cleopatra’s rule, and in 37 B.C. Antony again met with Cleopatra to obtain funds for his long-delayed military campaign against the kingdom of Parthia. In exchange, he agreed to return much of Egypt’s eastern empire, including Cyprus, Crete, Cyrenaica (Libya), Jericho and large portions of Syria and Lebanon. They again became lovers, and Cleopatra gave birth to another son, Ptolemy Philadelphos, in 36 B.C. 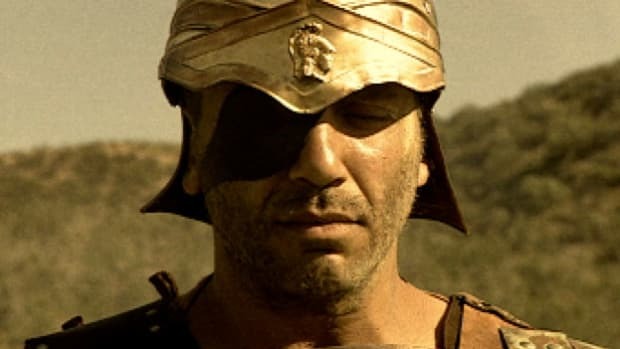 After a humiliating defeat in Parthia, Antony publicly rejected his wife Octavia’s efforts to rejoin him and instead returned to Egypt and Cleopatra. In a public celebration in 34 B.C. 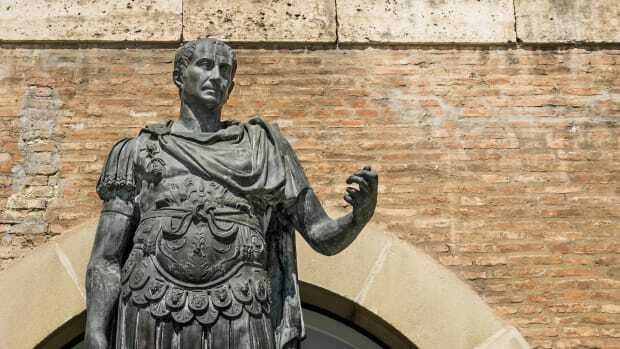 known as the “Donations of Alexandria,” Antony declared Caesarion as Caesar’s son and rightful heir (as opposed to his adopted son, Octavian) and awarded land to each of his children with Cleopatra. 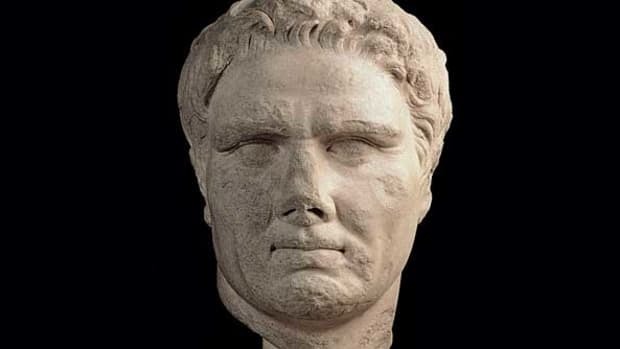 This began a war of propaganda between him and the furious Octavian, who claimed that Antony was entirely under Cleopatra’s control and would abandon Rome and found a new capital in Egypt. In late 32 B.C., the Roman Senate stripped Antony of all his titles, and Octavian declared war on Cleopatra. On September 2, 31 B.C., Octavian’s forces soundly defeated those of Antony and Cleopatra in the Battle of Actium. Cleopatra’s ships deserted the battle and fled to Egypt, and Antony soon managed to break away and follow her with a few ships. With Alexandria under attack from Octavian’s forces, Antony heard a rumor that Cleopatra had committed suicide. He fell on his sword, and died just as news arrived that the rumor had been false. On August 12, 30 B.C., after burying Antony and meeting with the victorious Octavian, Cleopatra closed herself in her chamber with two of her female servants. The means of her death is uncertain, but Plutarch and other writers advanced the theory that she used a poisonous snake known as the asp, a symbol of divine royalty. 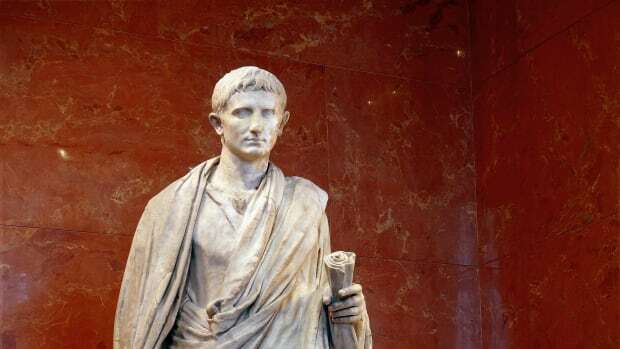 According to her wishes, Cleopatra’s body was buried with Antony’s, leaving Octavian (later Emperor Augustus I) to celebrate his conquest of Egypt and his consolidation of power in Rome.